I bought a few more books. I am always buying a few more books. I figure everyone has their indulgences, some people spend lots of money on coffee or wine or shoes. I spend my money on books and books are more affordable than wine or shoes. I did manage to have books delivered on both the recent snow days. That made me happy. 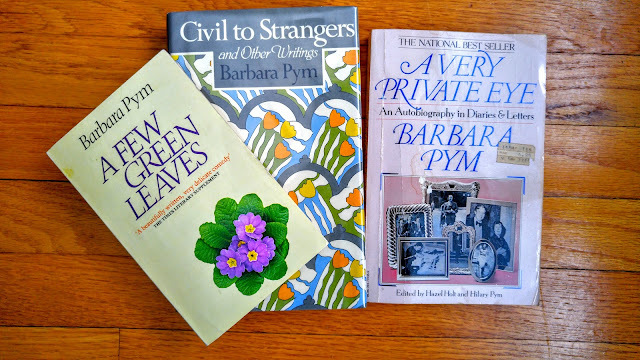 I have read all of Barbara Pym's books but I don't own them all so I am trying to remedy that. 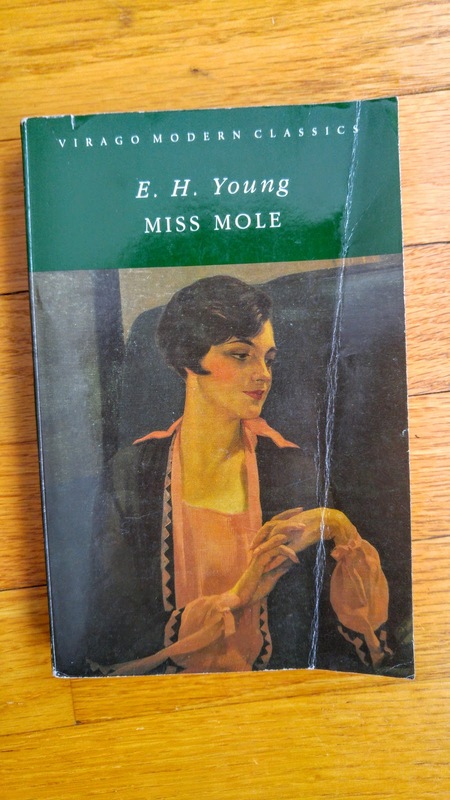 I know very little about her life so I also got a copy of her autobiography. It is edited by Hazel Holt. I have read and enjoyed her series of cozy mysteries. I believe the two were good friends. It is written using diaries and letters which is a format I enjoy. It satisfies my nosy side. I like the cover of this book. 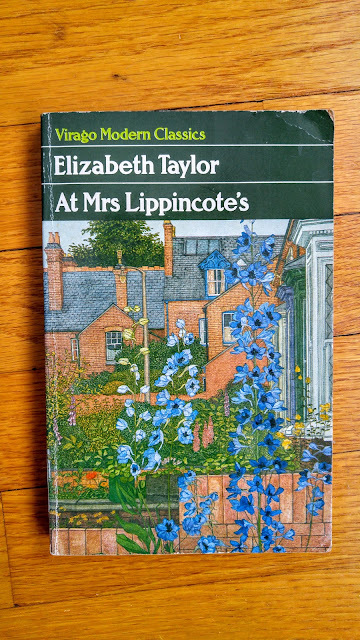 Elizabeth Taylor writes such quiet yet incisive novels. I think I might have read this one years ago but I am not sure. Anyway, I get to read it now. I love E.H. Young's books and I hear very good things about Miss Mole. From what I can tell, it is generally supposed to be the best of her works. The back cover describes it as her masterpiece and it won the James Tait Black Memorial Prize in 1930. That is not a prize I have heard of but a prize winning book is a prize winning book. I also got a couple of books for my daughter. She has been reading the Melendy books by Elizabeth Enright and we have had a hard time getting hold of the last two books in the series. She debated having me buy them since she is a bit beyond optimum reading age for them and she thought it would be a waste of money to buy books she would be done with very quickly. However, I knew she really wanted to read them so I ordered them anyway. The last one showed up yesterday when she was home sick from school and it kept her happily occupied for a little while. Oh the joy of book mail :) I have a copy of the Pym autobiography as well, and I'm looking forward to tracing possible connections between her books and her life - as well as learning more about her life in general. I have the Melendy books on my shelves now, and I still re-read them :) Though I only have three - I've never read Gone-Away Lake, is that the 4th one? The four books in the Melendy series are The Saturdays, The Four-Story Mistake, Then There Were Five, and Spiderweb For Two. Gone-Away Lake and Return to Gone-Away are a different series. My son loved those. Hahahaha! I bought a few more books. I am always buying a few more books. That is so exactly me. It's a bit of an addiction, isn't it? My husband just asked me to order a book for him and it seems a bit silly to only order one book. Or maybe that is just me and my addiction talking? Anyway, now I am puttering around seeing what else I can add to the order. Yes, it is. And I'm exactly that way. They're sending a box through the mail -- why should it have only one book in it? That seems so wasteful. Out of Elizabeth Taylor's works, I've only read Angel, which I adored. Which other books by Taylor do you recommend? I still have a few of her books to read. I have been spreading them out for optimal enjoyment. I recently read Mrs Palfrey at the Claremont. I enjoyed it and I think you would too. There is a movie but I haven't seen it yet.